Vertical Infinity is a battle between two futuristic human civilization named Logica - people of head and Eternia - people of heart. Teams are lead by respective captains who are representatives of the team characteristics like personality, philosophy and psychology. Vertical Infinity card game is a collectible card came where player can bet on their strategy and increase their collection of cards and create their own pack. Team who has chosen to completely get transformed into machine or bots, which are lethal, precise, accurate and mostly importantly give importance to rationality over emotions. Team of more than humans who have consciously chosen to have partial machine like body parts that enhance their certain body performance but retained the emotional aspects of human existence. Character in the game evolve into multiple revolutions. Evolution is the experience based on the choices and actions that earn them good or bad karma. Higher the revolution of the character, enhanced are the skills of the character. CP (Combat Points): Combat points the hit points of that particular character. Health: This denotes the health of the character. Speed: This parameter denotes the speed with which the character moves. Agility: This parameter denotes the swiftness which the character performs action in the game. A highly rained Ex-Machina, with the ability to sprint superfast and cause high damage. Good sprinting, low alert, poor damage effect and good HP and CP. A strong Eternia character, has an ability to sense and predic the position of the locked enemy with amazing accuracy. Good sprinting and cause good damage o the opponent. A stylish characte with good CP and HP. A highly efficient autobot with an abilituy to knockout with its two turrets. Average sprinting with good damage effect. 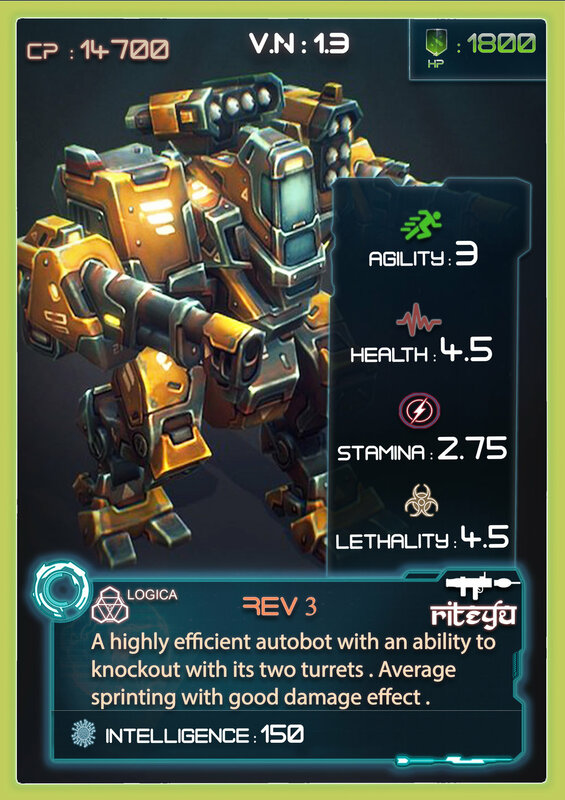 A reloable small heavyweight autobot of the team can neutralise the opponents. Super fast speed with good damage effect and alert. More CP and HP.